The DC Comics Rebirth event has been fantastic, not simply because of the good story lines but because it was an exciting time to introduce a family friend to comic books. I don’t want to put his real name out there, but we will call him Fred. Fred has autism. He didn’t know these heroes by default. “Default,” in case you are wondering, is a preselected option adopted by a computer program or other mechanism when no alternative is specified by the user or programmer. Now my friend Fred is reading Batman, Detective Comics, Justice League, Superman, The Flash, and Cyborg. He knows most of the characters in the DC line-up as well, and he can enthusiastically engage in a discussion around the characters. What’s more important is I’m sure he loves these stories. I see it in his eyes when we finish a comic and sometimes in his frustration when the comic leaves us on a cliffhanger. He’s still happy about it, but at times may want to know what happens to Batman. I think we all can relate to this. Batman might be his favorite character, but his other favorite is Cyborg. At the end of the first issue, I saw a different reaction from Fred. I think he’d found a hero with whom he could relate. I think Cyborg may be a hidden hero for folks on the autism spectrum. Cyborg is a hero who is half man and half machine. His current origin is that he was a promising athlete that was injured in an accident and saved by his father who replaced his damaged tissue with an alien tech. As a hero, he doesn’t know his full capabilities, and he is often struggling with a few issues: his internal struggle to find balance in himself, his struggle to find his place in humanity alongside how the rest of the world views him. The first comic of Cyborg Rebirth brings these issues out at breakneck speed when an alien technological monster captures Cyborg and gives him an offer. The monster is trying to force Cyborg to join his machine army. Of course, Cyborg is half-human, and he’s fighting to keep his humanity while also fighting to save all of humankind. 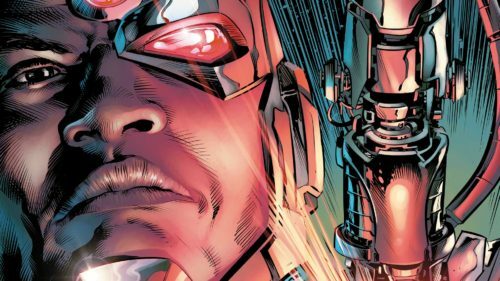 There’s a lot of similarities between Cyborg’s struggle and autism. The first being that although autism doesn’t turn a person into a machine, sometimes the rigidness and the ritual of the symptoms can seem almost mechanical in nature. The need to repeatedly commit to one act or the desire to have to finish a task first before moving onto the second can seem machine-like. Often, folks in this community will even struggle with the ability to gauge when one task takes precedence over another. It’s a rigidness that shows us why the best engineers and computer programmers often fall somewhere on the spectrum. They understand the machine at a level many of us do not. The end of the first issue of Cyborg has (mild spoiler alert) Cyborg discovering an old recording of his dad asking a very Mary Shelley-esque question: “Had I saved a human being or just created some new kind of machine bereft of everything that makes us human?” This concern of his father leaves Cyborg hurt and confused. Much of the autism community struggles at times with being close with folks they love. Not because they are incapable of it. When you love someone on the spectrum, you find out very quickly that it is a love that goes deeper and further than almost any connection you’ve ever felt in this world. Folks with autism are capable of great love, but they often struggle with sensory issues. Touch, sound, smell, taste, even emotion can feel too overwhelming at times, so they struggle with themselves to get to the point where they can bring this bond forth. Cyborg’s issue with his father is the perfect example of this. He can’t outright say, “Hey dad, I’m fine! I’m still me!” He can only prove it by fighting through the internal struggle and facing down catastrophes and monsters. Maybe then he will prove to his father that he possesses more humanity and love than most folks ever know. 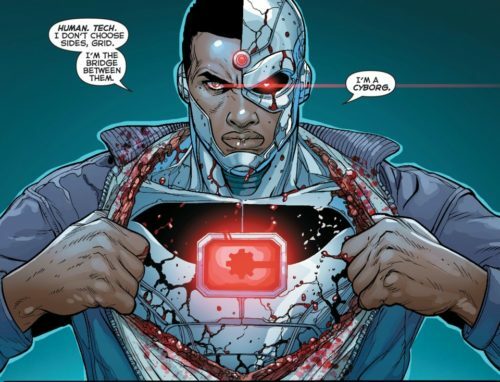 Which leads us to Cyborg’s last struggle, how the rest of the world views Cyborg. Anyone who has loved someone with autism knows that sometimes, folks who are not exposed to this population can be cruel. Some of them refuse to look on with soft eyes and see beyond their autism, see that there is a human being there, a person who is a son or daughter and just wants to be loved and respected. Folks with autism and family members of them don’t want to have to explain who they are to the rest of the world. They shouldn’t have to explain why these behaviors happen. These families never chose autism so that burden shouldn’t fall to them. The world should change its views on these folks. They aren’t going to change who they are. Folks with autism aren’t going to wake up without autism tomorrow, any more than Cyborg is going to suddenly be severed from his machine half. Instead of seeing behaviors (or Cyborg) as something different and frightening, the world should see the heroes that deal with this struggle daily. The world should see the parents who never give up on their kids and thank them for being good parents. The world should see the kids and adults who never know reprieve from being overwhelmed and love them for pushing onward. For being who they are. Judgment should be set aside with autism and Cyborg because they are heroes without question. They are heroes by default. Author Steven Mix is the creator of the Mixy award, has worked with the autism community for a non-profit organization, and was a paratrooper in the U.S. Army. He's an avid D.C. comics and Star Wars fanboy with a love for almost all things sci-fi.